The Labiatae, or family of mints, consists of about one hundred and sixty genera, including the one to which the Oswego Tea of our illustration belongs. Under these genera are classed over three thousand distinct species. Many of these are well-known plants, such as the mints, pennyroyal, anise, bergamot, fennel, catnip, sage, thyme, lavender and rosemary. Representatives of this family are distributed throughout the world in the temperate and tropical regions. In fact, it is one of the most cosmopolitan of the plant families. This genus includes about ten species, all natives of North America and Mexico. 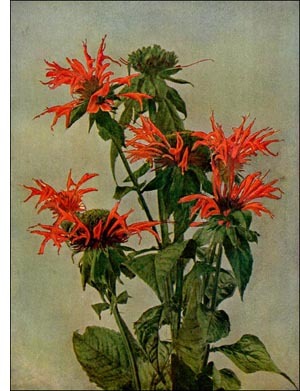 The Oswego tea is frequently called Bee Balm, and locally it is often known as Fragrant Balm, Mountain Mint, and Indian Plume. This plant prefers a moist soil near the wooded banks of streams and in the hilly and mountainous regions of Canada and the United States, east of the Mississippi River. In North Carolina it is found at an altitude of about five thousand feet. The leaves are egg-shaped, elongated, taper-pointed, and more or less saw-toothed on the margins. The floral leaves are tinged with red of nearly the same shade as that of the bright red and showy flowers. The flowers, which appear in July, August, and September, and are about two inches in length, are massed in a dense solitary and globular head, which is situated at the end of the flower stalk. The flowers produce an abundant nectar, which attracts bumblebees, butterflies, and humming-birds; these, by transferring the pollen from flower to flower, assist in the fertilization of the developing seeds. The ordinary bees are barred from the sweets of this plant because of their short tongues, though some forms will cut a hole in the side of the corolla and obtain the nectar in this manner. It is said that certain Indian tribes use this bark in preparing a tea that is nearly as palatable as that made from the ordinary tea of commerce.